Sometimes you make an idle discovery that keeps you smiling all afternoon. 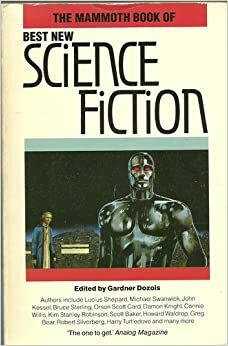 My first taste of “real” sci-fi was at 16 or so, with The Mammoth Book of Best New Science Fiction, a collection of shorts edited by the great Gardner Dozois. I’d started to cool on the SF available in the UK around then – Asimov and Arthur C. Clarke had started to sound a bit samey and William Gibson hadn’t yet hit the headlines with his scorching (if today oh-so-80s) visions of cyberspace. And what an escape it was. Dozois is American, and probably the greatest sci-fi editor alive. (And thankfully still pushing ’em into print today.) I’m pretty sure I first met William Gibson and Bruce Sterling in these pages. (Checking, both had shorts in it, but I vaguely remember having read “The Winter Market” before; perhaps Gibson’s antho “Burning Chrome” was already out at that time, but it wouldn’t have been too many months apart.) I remember Steven Gould’s “Peaches for Mad Molly”, one of my favourite-ever sci-fi shorts, although it turns out that was in SF3. All this is why the later books in the Mammoth series were among my first Kindle purchases decades later. Rereleased editions go back to Volume 13 and the 27th is just out. But nothing before 13 is available… and that’s where the smile started. Because these books are published in the USA and UK under different titles. The UK’s Mammoth 27 is also the USA’s Year’s Best Science Fiction 31. And the Year’s Bests are also available on Kindle, going all the way back to the first volume. So it doesn’t matter that the Mammoth books on Kindle only go back to 13, because British readers of Mammoths can buy Year’s Bests to complete their set. Not just back to 13, but the whole kit and caboodle, starting with that first Year’s Best from 1983. So: finding the American Year’s Best editions on Kindle let me complete my set and go beyond, with the three first collections published solely in the USA and the “missing” collection Year’s Best 12. Today, they all went on the Wishlist. Posted 4 years ago by chrisworth. Posted 5 years ago by chrisworth.